This Halloween, I knew I needed to get a head start. Last year it crept up on me and my costume was thrown together in a fury. The minion look turned out pretty adorably, yet it wasn’t super original, and it was more stressful of an experience than I’d hoped for. 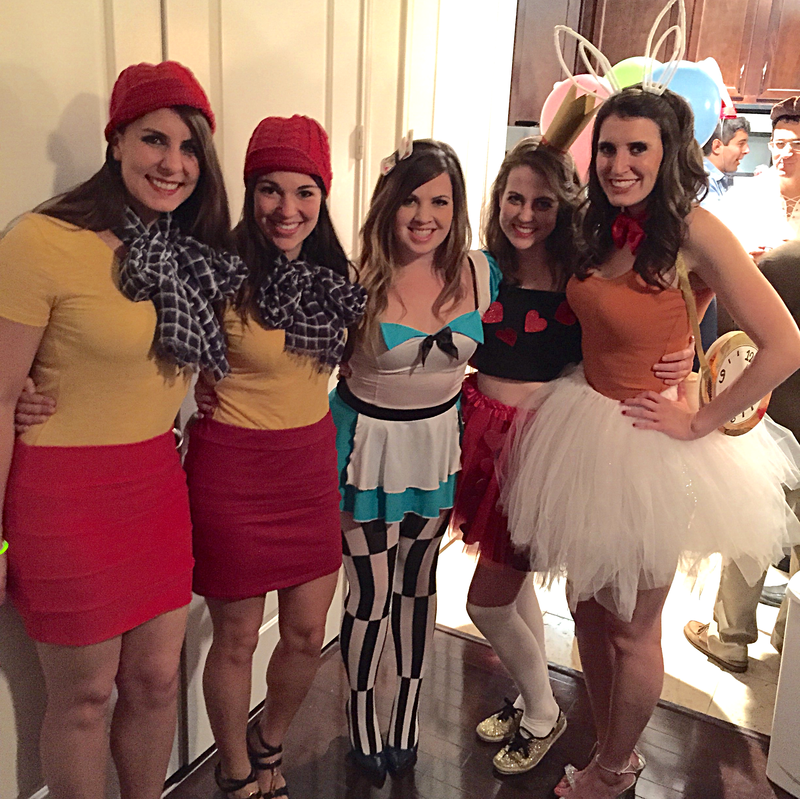 This year, a few of my girlfriends and I started brainstorming in September and decided upon a group costume using the Alice in Wonderland characters! There are quite a few of them, ranging in difficulty to create or purchase, giving everyone their pick! 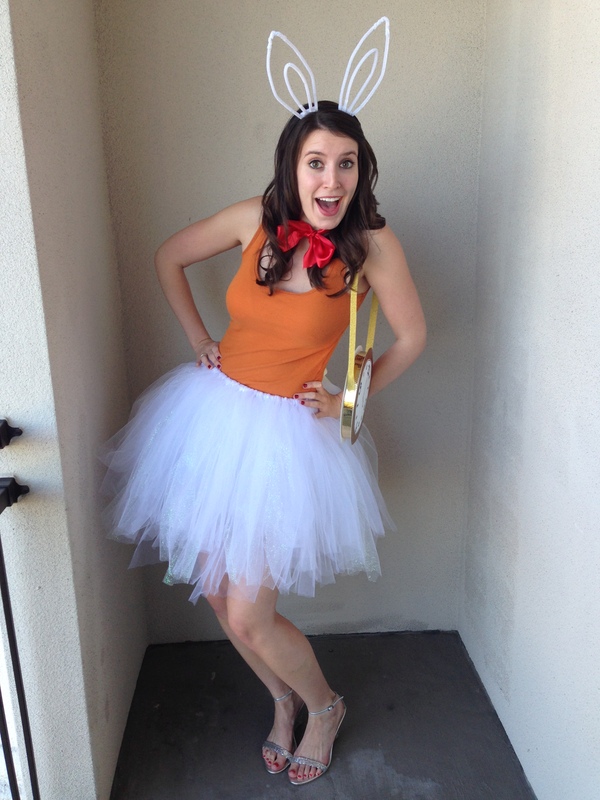 You all know me by now, so obviously I wanted to be the rabbit. Rabbits have also gotten a sad, trashy connotation around Halloween and we couldn’t have that happen either. 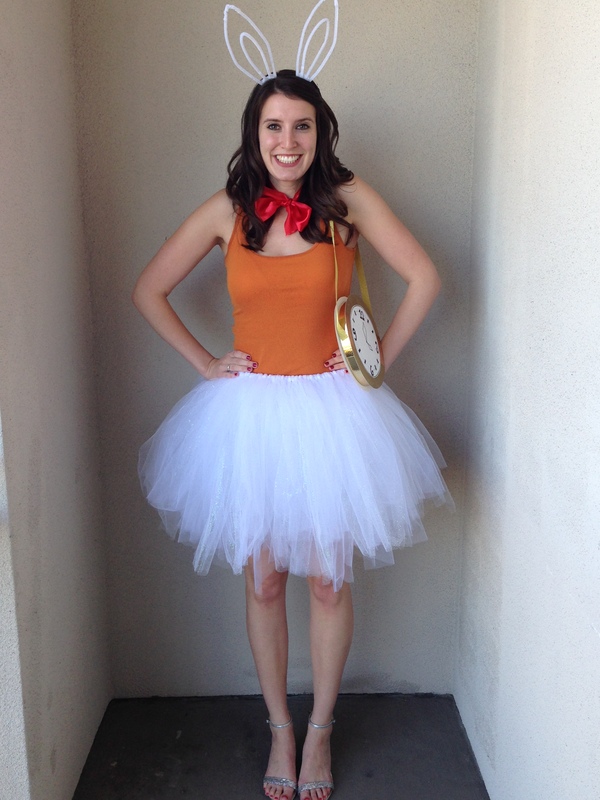 What better way to make a costume “cute” than to revert back to childhood? I was making a tutu. Along with the tutu came loads of glittery, fun accessories, all explained below. I think we all did pretty well on our character renditions, don’t you think? 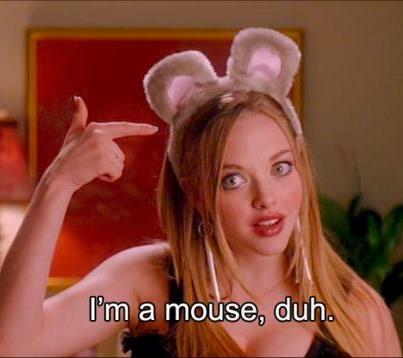 Happy Halloween, hope you’re inspired for your next costume party! To make a tutu is actually a really simple process. All you will need is a long piece of ribbon that fits around your waist, plus a foot or so to tie into a bow, lots and lots and lots of tulle (I used about 80 yards worth of 6″ wide tulle), some scissors, and a ruler. Start by measuring out one length of tulle to about 4 feet in length and cut it. I then used this piece of tulle as a measurement to cut the next million pieces (you will be cutting tulle forever). To assemble the tutu, take one piece of tulle and fold it in half. Place the folded end underneath the ribbon and loop the other loose ends through it and pull them tight. This will make a knot. Repeat with all of your tulle until you have filled the length of your waist on the ribbon. Tie it up in a cute bow in the back and you’re done! 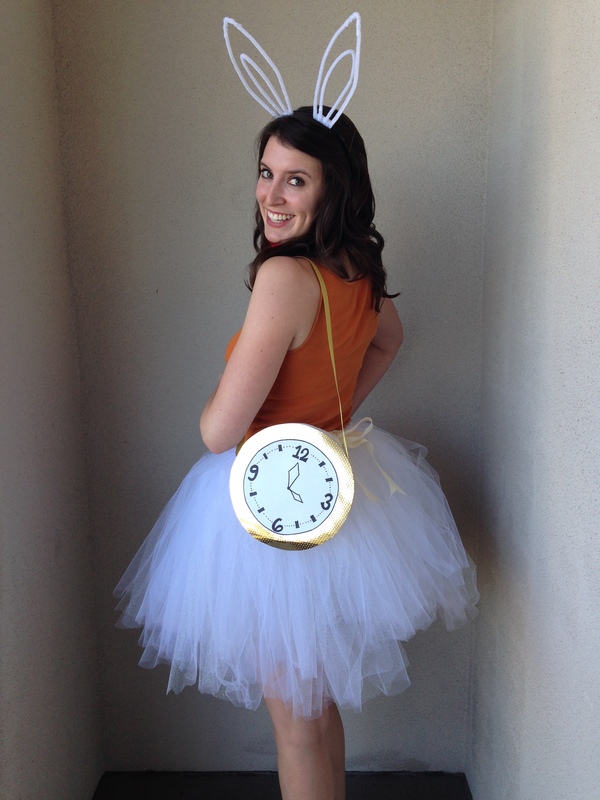 No Alice in Wonderland Rabbit is complete without a clock. How else will you know you’re late to a very important date?! I made a shiny, fun time keeper for myself out of an 8″ diameter round piece of foam, two pieces of 12″ x 12″ gold paper, one piece of white paper, one yard length of gold ribbon, a black sharpie, a hot glue gun, and scissors. Take your gold and white papers and flip them upside down. Trace around the foam piece on all pieces of paper. Cut just inside the lines on the white piece of paper so it is a little smaller in diameter than the foam, and cut just outside the lines on the gold pieces of paper so they are a little larger in diameter compared to the foam piece. Now measure the width of your piece of foam, mine was about 3/4″ thick. Cut out long strips of gold paper to match this thickness and hot glue them onto the foam. Next, hot glue the gold pieces onto either side of the foam circle. Draw a clock pattern on the white circle and hot glue that down onto the gold paper. To finish it, glue the ends of your ribbon onto the sides of the clock about 180 degrees from one another. These are the easiest craft you can make and the cheapest way to sport bunny ears I know of. Stop by a craft store and pick up some pipe cleaners and a plain headband (or use an old one like I did, you can reuse them after your stunt as a bunny). Take two pipe cleaners and make an X at the end of them. Twist them together until you have a V shape. Repeat this with two more pipe cleaners. Then line the the loose ends of the pipe cleaner V’s up with the head band about 2 inches apart from one another. Wrap a couple inches of each pipe cleaner around the headband to secure. Repeat with the other V of pipe cleaners. To finish off the ears, take another pipe cleaner and fold it in half. Place this in between the large ear shape and wrap around the head band. Repeat on the other ear. Throw ’em on and flaunt your adorable self! 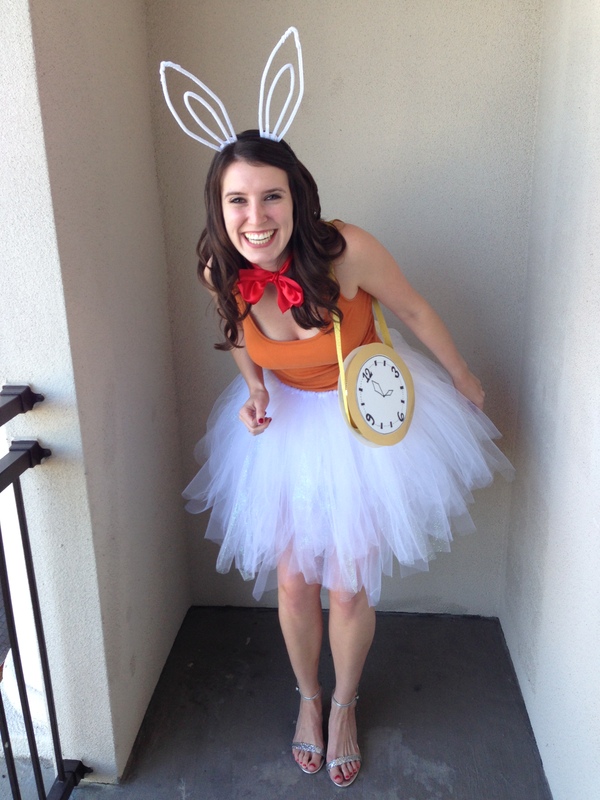 With my dreams of being a rabbit complete, what could come close to topping this costume next year?? So unbelievably cute you made it look so easy! Thank and link back to the awesome person who nominated you. List the rules of the award. 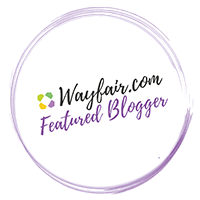 Nominate other bloggers and comment on their blogs to let them know. I posted a response for this today on my blog, thanks again! That’s so cute! I really like the clock! That was a fantastic idea! Your costume came out great, I love it! Super simple too. I had considered that as a costume this year but couldn’t find an easy way to make it myself.